We do eat ham and jam. That title is the line from "Monty Python and The Holy Grail" movie that inspired "Spamalot". Even though I've been a MP fan since the 70's, I still will not eat Spam. Not even if they sing about it. But I will not EAT Spam. 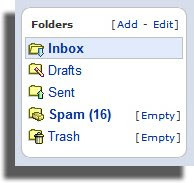 Now THIS is SPAM Nirvana!!! How the heck did we miss out visiting one of Minnesota's biggest attractions while we were there last week? Perhaps it was the numerous few Mojitos we had partaken of, but when we saw this flyer in the hotel lobby on our last night of vacation, daughter and I were just rolling on the beds in fits of laughter reading this.... so hard we were crying trying to figure out if this was an actual place or just a joke. Dammit! 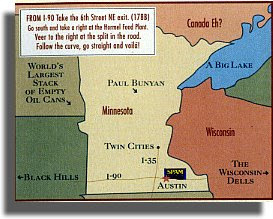 As we perused the pamphlet looking for directions to Austin, I discovered we ALSO missed out seeing "The World's Largest Stack of Empty Oil Cans" in North Dakota!! Now we're going to have to return JUST to hit these world-famous tourist attractions. do you think they have vintage spam at that museum? kinda like visiting a winery, maybe you could taste different varieties of spam that have aged different numbers of years to appreciate the effects of age on the finest potted meat-like product on the market? that would be fun though, to go do all those ridiculously cheesy "attractions" as the focus of your vacation. i always wanted to stop at those "mystery spots" where they claim that the laws of physics no longer apply and cars roll up hills in neutral and the magnetic poles are reversed and other ridiculous things. did you at least stop and take a pic on paul bunyan's lap? Ha ha ha! It's rather fitting that 'Spam won the war' because it is something people in the UK ate quite often after the war. It made a very cheap meal, with potatoes and peas - even spam fritters. I can't believe that people would still eat it - and through choice! Never eaten SPAM and never will after someone told me it tastes like human. And then I read that in a book that had cannibals in it (don't ask) and they said that too. SO no SPAM for me. Loved the show SPAMalot! though. 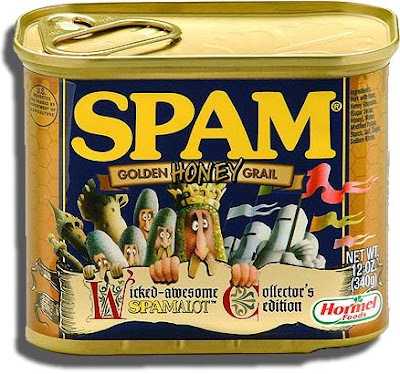 Haven't had spam since college-- over 20 years ago. It was all I could afford back then. Some people really love their Spam. They tried to serve it to us in elementary school and when every tray went back w/ the Spam still on it, they abandoned the idea. Winlock has the world's biggest egg? I heard Moses Lake is going to have the world's biggest lava lamp too. OK..no way. Is this where all our hard earned money goes? Because you know the federal government had something to do with that dang museum. Either that or the poor people in that town have had to endure fundraisers to "save the hall of spam." Funny, funny post. Disturbing, but funny! Ashley: Oi. Vintage Spam? The only thing worse than "fresh" Spam...and no, we missed out on Paul Bunyan as well. We were too busy hitting the malls, thanks to you-know-who. Babs: I know! Unless I was starving (well, maybe not even then) they have to force me to eat it. Lucky you; I would love to see Spamalot! Ed: Yuck. I would rather take bread and water than "mystery meat". Ann(ie): No Way! The World's Largest Egg? Do they also have the World's Largest Chicken who laid it???? JoJo: Lava Lamp??? Shouldn't Moses Lake have the World's Largest Parting of the Water??? Jonny's Mommy: Har! I wonder if that town has the largest per-capita consumption of Spam in the world...hmmmmm. One of the enduring memories I have of my school days is being served Spam fritters for lunch. Ugh. HORRIBLE, greasy, nasty, slightly sweet-tasting meat!! If that's what human tastes like, I don't want any! LOL! I'm telling you...one of these days (maybe after I hit the lottery) I'm going to rent an RV and see the fine things this country has to offer. Things like oil cans and SPAM. And for the record, SPAM's not half bad. Jay: Spam "fritters"??? How could they make Spam even worse? Oh yeah. Deep fry it. Yikes! Jill: Remember, that's Austin Minnesota, not Austin Texas. Wow! I'm amazed there is so much info on spam! What disturbs me about spam email is their obsession to make me buy a penile implant. It makes me question myself. Do I look like a man? Am I grwoing facial hair? 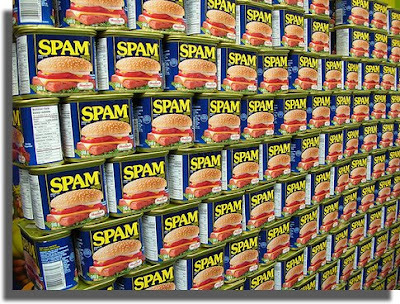 Didn't SPAM originally stand for spiced ham or something? Whatever, it's nasty. Spam is an aquired taste, that is directly proportionate to how hungry you are. After trekking through the wilderness for 3 days with not food. Spam is delicious, otherwise, maybe not. Bee: Amazed AND disgusted at the same time… Now we know why that crap is called Spam mail; stuff that should be just chucked in the garbage bin. Diesel: I think you may be right. And agreed on the Nasty. Vile stuff indeed. Lotus07: Acquired taste? Not for this tongue. I would rather try tree bark. OMG I have to find the Spamalot can! Can you tell me where you got the pic so I can shag a few down? In my crowd they'll make awesome Christmas presents. or eBay... they were "Limited Edition", so be prepared to pay more! Dang! Well, it's one more reason to go back. I still have nightmares about being forced to eat Spam as a child. I wonder if it would be as famous if it had a different name. There's just something about "SPAM" that's hilarious. There are plenty of other gross food products that don't have a museum.